Poppet and the hooks matches better, seldom jams; With the guidance of the draft angle at the bottom of the gasket, the poppet can reach the sealing position accurately; Less distortion of the basket than 3 hooks; A smoother flow route increases the flow rate by 10%. Options: inlet flange drilled 8 x14mm holes equi-spaced on a 178mm PCD; outlet flange drilled 4 x 17mm holes on a 160mm PCD. Contact parts manufactured in 316 stainless steel with combined main seal as standard. Other poppet seal materials available. Footvalve may be manufactured in other metals. Full range of 30°, 90° and 180° highlift footvalves. Steam heated option. Available with integral Hastelloy seat area. A range of bolt kits and outlet gaskets are available. We also make 4-8" footvalves. 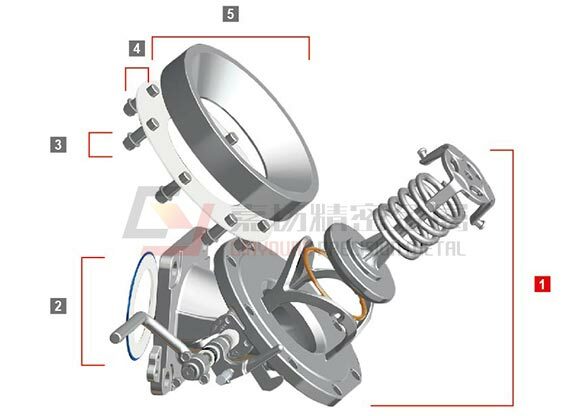 To ensure that the tank remains sealed in the event of an accident, the valve body incorporates a shear groove, designed to fail in such a way as to leave the internal part of the valve closed and attached to the tank body. 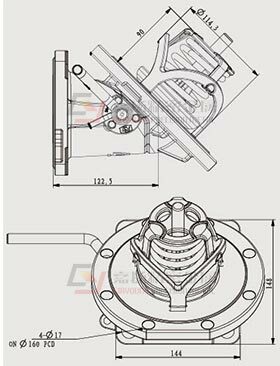 To ensure that the tank remains sealed in the event of an accident, the valve body incorporates a shear groove, designed to fail in such a way as to leave the internal part of the valve closed and attached to the tank body. Poppet and the hooks matches better, seldom jams.With the guiding of the draft angle at the bottom of the gasket, the poppet can reach the sealing position accurately; Less distortion of the basket than 3 hooks; A smoother flow route improves the flow rate by 10%. 3" 45° Twin footvalve, inlet flange drilled 8 x 14mm holes equi-spaced on a 178mm PCD. Footvalve body incorporates integral 3" butterfly valve terminating with 3" BSP outlet and stainless steel blank cap. 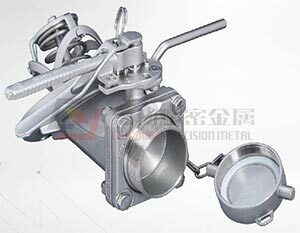 Manufactured in 316 stainless steel with combined main seal to footvalve and PTFE main seal to butterfly valve and cap. Footvalve may be manufactured in other metals. Full range of 30°, 90° and 180° highlift footvalves. Steam heated option. Available with integral Hastelloy seat area. A range of bolt kits and outlet gaskets are available. We also make 4-8" footvalves. To ensure that the tank remains sealed in the event of an accident, the valve body incorporates a shear groove, designed to fail in such a way as to leave the internal part of the valve closed and attached to the tank body.To ensure that the tank remains sealed in the event of an accident, the valve body incorporates a shear groove, designed to fail in such a way as to leave the internal part of the valve closed and attached to the tank body. Fuse link effects the automatic closure of the footvalve (primary valve) in case of fire. The device incorporates a fusible element designed to operate at 100°C (212°F) and is linked to the remote closure cable. Quick and easy to fit on the container tank frame and compatible with all tank designs and with most footvalves on the market. Complies with U.S. DOT CFR49 - ch.178275 [d]. 1. Drill & tap tank frame m6 at centres quoted clamp remote closure wire to chain using cable connectors. 2. Ensure that there is minimum amount of slack on the chain when the valve is in the open position. A range of stainless steel check caps is also available. These comprise a cap with an indicator which allows the operator to check if there is any residual pressure. The part numbers have a 'CK' suffix instead of the 'PS'.